At its simplest form, the theme of this record centres on the hope that Christ's love provides. The music definitely proclaims the Bible verse, "And now these three remain: faith, hope and love. But the greatest of these is love" (I Corinthians 13:13). 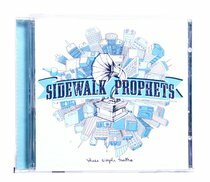 "Sidewalk Prophets has a vision to help people young and old embrace the uniqueness God has given them. We believe that finding your identity in Christ is one of the most crucial steps in truly loving others." Customer Reviews For "These Simple Truths"
Fantastic CD from a brilliant band....the music is full of Hope and Faith and lifts your spirit high....Can't wait for the next one to arrive! This album is absolutely brilliant. I can't for their next - the music is full of hope and inspiration. God bless this band.